So you're an avid gamer and you've got this really amazing Gaming Laptop ! Awesome ! What about the perfect Laptop Stand to compliment your gaming laptop ? While you've got ton's of choices available for awesome game titles, and a myriad of choices when it comes to power packed gaming laptop - the choices get pretty limited as soon as you're down to choosing a laptop stand to go with the entire package. Does not finding the right gaming laptop stand frustrate you ? Do you often wonder why didn't someone think this through end to end? After all your requirements are pretty simple - it's not rocket science! Alas ! It's not easy for someone who's not a passionate gamer to understand what you're looking for in a perfect laptop stand. Outlined below are some of the choices that you can consider. All of these product choices are available for you to buy from our store (yes - so we're a bit biased) - but please don't think that's the only reason why this article is being written. That being said - without further ado - let me just get down right to the stuff which matters ! This one's a winner ! 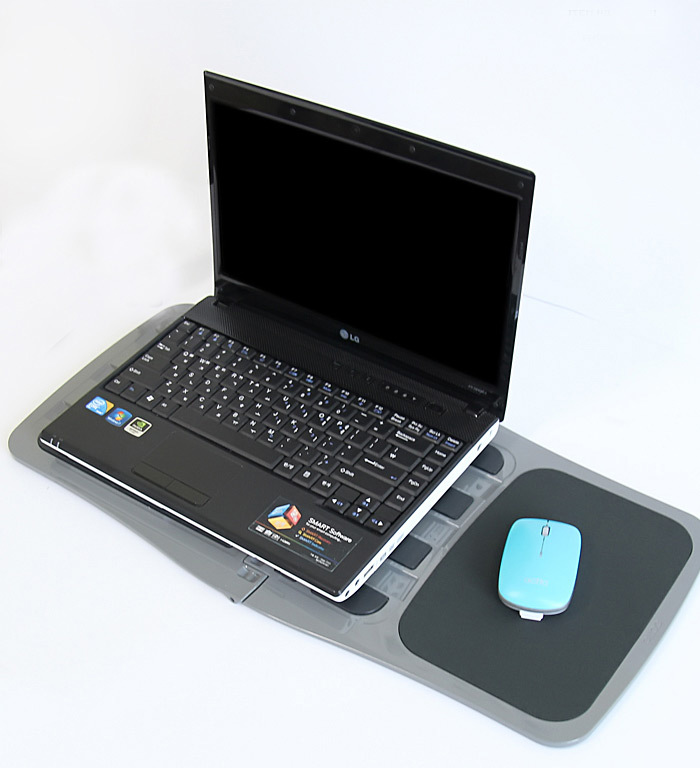 It's light-weight, its compact, can be placed on your lap and it has a mouse pad built-in. The Portable Lap Desk is versatile in design - allows you to play your favorite game while seating in a chair, the bean bag, your bed or maybe in the back-seat of your car (basically anywhere) ! The size is big enough for your gaming laptop (plus the ridges ensure the notebook does not slip off) and plus it folds flat and is easy to carry it along to your friend's place for a gaming night. It does not have a cooling fan (let's be real - the laptop does heat up after those long gaming hours). Ok - I'm going to honest here ! Logitech does not do things half-hearted ! This is an amazing laptop stand, but when evaluated critically from a gamer's view point two things don't add up. First - The Price Tag ! Whoop - spending $100 bucks on this .. hurts ! Second - the cooling fan is just not strong enough! I've personally tried using this stand (a marathon movie night-out) and found that the cooling was just not good enough after about 2-3 hours of continuous usage. This handy little laptop cooling stand is for those serious gamers who have a dedicated corner setup for their game-play. Ideally - you'd be using a separate key-board as well. This laptop stand from Actto has two powerful cooling fans (really effective) has multiple height adjustment settings and not to forget, the spare USB ports for you to connect some of your other gadgets as well. Overall - its got good looks, it's well priced, is light-weight, compact and does the job well. Not much - but just a few (when evaluated from a gamer's point of view). Firstly - you cannot play your favorite game while keeping the laptop on your lap. Secondly - it works best with an external keyboard (not ideal if you're keen to use your laptop's keypad). We're now getting serious about laptop stands best suited for extreme gaming, so let me recommend a patent pending product called Notepal U stand from Cooler Master. Priced at the mid-high band, the gadget is power packed with relevant features. You can use it anywhere, its's got all the handy USB ports (including a mini USB port), has a solid build and plus it's most unique feature - detachable cooling fans which you could place exactly where you need it most (i.e. just below the hotest zones of your laptop). It pretty much tick's all the boxes which matter to an avid gamer. Are there any ? Let me think .... ... well - it's hard for me to point any negatives with this product ! It's just perfect. The only reason I've ranked it second is cause it looks a bit dull (will not impress / daunt your opponents). Finally a laptop stand made specially for the serious gamers. No matter if you're a novice or a pro - this is the "Ferrari" of the Laptop Stand for Gamer's world. Just look at this gadget - it screams attitude and that's exactly what you want! Feature packed with a massively powerful yet silent cooling fan (with an on/off switch), spare USB ports for you to connect your accessories, two fold out support shelf to keep your laptop in place (this is to prevent your laptop from slipping over - if you make a sudden movement while being totally immersed in the game), ergonomic & adjustable design and lastly and most importantly - really fancy lights - which gives it that "angry and grunty attitude". 5 stars to this product. I've just started using this Notebook Stand about a week back and am pretty convinced that this is the best suited product for me. Err... do I really need to lay it out? Well - just cause you're putting me into a corner - he's what I'd suggest could be a potential negative (mark my use of the word potential) - its the overall looks ! While a flashy looking stand with neon lights would go really well with Gen Y, some of other serious gamers with grey hairs might favor a laptop stand with muted looks. So there you are - the five best choices which I've put forward. Now - its quiet normal for to have a different view to what I've presented (I'll attribute that to the fact that I may not have tried and tested all the different choices available globally), but in summary - I'd say that for someone who's struggling to find the right laptop stand to compliment their gaming laptop - this article can be a good starting point. Lastly and most importantly, if you're read through this article - feel free to contribute your views. Let me and other readers know of other good laptop stands which you think fit the bill. Growth is a fascinating time ! Things just happen on the double and in the rush to get going, one does miss out on small details. It was with much fanfare that we launched our blog in November of 2011 and now it's been nearly a year when we spotted that the link to our blog was broken and hence hidden from view of all our customers. We apologize. We've now fixed the issue. We're once again going to make a sincere effort to ensure that we constantly share up and coming news and other information articles with our beloved customers.